My story about mental health and how I manage it through exercise. Regular exercise can boost your mood if you have depression and has been of benefit to many of my clients including myself. Below is an article I wrote some time ago, it’s when I was going in to deep depression and I felt there was no way out. After this article I started to give up on everything including my marriage, my family and my business. But 11 months later I was in a better place with a new home, a rekindled relationship with my partner, an already thriving growing business and a now have a grandchild. I look back and ask how I managed to get to a better place, NOT back to normal as there is no normality in my life, just chapters whether turbulent or not they make me the person I am. For me fitness at the Gym Group Colchester was a sanctuary, it was my time for me, my time to feel good, my time to acknowledge me and accept me at that very time. Its benefits would stay with me for the rest of the day therefore training was a daily event which I still do however this wasn’t just the answer as I needed therapy from one of the best in Colchester. Having approached many agencies in request of help for therapy etc I realized the waiting list was just too long therefore I funded this myself and was the best spend ever. To many people are reluctant to look after themselves but since recovery I make a point of caring for me, I no longer worry about the future or past, I no longer waste my energy or time on things or people that have no direct benefit to my profession or life! Time is precious and is just too valuable for me to sit around over analysing the future as today is the day that I need to enjoy and learn from. I learned a lot from therapy and realized that many of the situations that had been presented to me through my life were not a direct result of my actions and that I needed to understand that and move forward from it. Relapse is my fear but as I said, why worry? let each day pass by and I will deal with whatever arises positively or negatively as I am in control! Take a look at my article below a few days after my breakdown as I can prove that there is an end goal and that it can be better in the end. Since retiring from the Armed Forces in November 2013 I have been a busy lad juggling study, family life, growing and demanding children and establishing an awesome business as a 1-1 personal training coach and boot camp instructor, Stabilis Fitness Academy that I am in love with and have so much energy for. My journey with my business was tough, as I had just retired from a very close-knit career that spanned across 22 years however the true reality of leaving the forces and that support hit me pretty damn hard as everything I once knew was gone and I mean gone as I was just that number in an organization that seen people leave every day. Challenging times with my own personal life, death of my children’s mother and the loss of friends who were killed in action took its toll but I assumed I had dealt with that and continued to move forward with a positive outlook. This huge world that I had come out too was not going to help me and absolutely nothing was just going to land on my lap. Hard work, drive and determination is what gets you to any place and that’s with everything including mental health however I was avoiding that whilst I focused on everything else. I initially started with 1 person to having over 60 people a week through 1-1 coaching and boot camps who I spend time with. All clients have their own amazing story and challenges to overcome which is just awesome and having worked with over 300 people so far since starting I think I have done remarkably well. I have spent time with counsellors on more than one occasion then I write it off and assume I am all-good even after my partner is advising that I must continue to help myself as well as others. My stubbornness got in the way and I told myself that I was ok and due to my uncertainty with my mental health and my sudden changes in mood I even at one point tried to throw away my relationship with my partner just because I thought he would be better off without me. I hate who I am in that very short period of what I can describe as being taken over by something else because it isn’t me, it isn’t what I am about but again avoidance was on the agenda. Since starting my new career the gym has become my saviour; my clients have become my focus. Helping people in need is a good and essential part of my life and I will continue to do my good work as long as I have a breath in my body but I wasn’t looking after myself because I was still in denial and not accepting there was anything wrong. I know we all have bad days and man I have had a fair few. I also have amazing days and enjoy life to its max. I have a great partner who does everything for me from cooking all meals, and looks after the house and allotment. However I truly haven’t shown my appreciation even though I wouldn’t have got here without them. I cancelled Dublin as the pressure of going was just too much. I started deleting everything that was placing pressure on me. Things such as texts messages, phone calls, emails and everyday life became harder. I started to shake daily, I felt like I wasn’t in my body. The final straw was when simple things like not remembering where my phone and keys were and even where I parked my car. I even had a meltdown in front of a client, this was pushing it too far and I started to accept that something clearly wasn’t right. My cry for help was to talk to people, this slightly helped but no matter what I tried, the overwhelming feeling of anxiety took over. Groups of people became too much, and even walking down the street was a challenge and all this has been in the last week! I even started opening to my clients, I believe this is very important, as there are too many personal trainers out there who are far from being real people. With guests travelling from around the country and Germany I wasn’t about to cancel but remember I said I was not good around crowds. The anxiety was present all day and when I walked in to the venue my heart sank. The evening was tough as people wanted to say hi, friends were jumping around, grabbing me, laughing etc but I was a mess, spinning and feeling vulnerable. I couldn’t cope so I kept walking out to get air. That’s now over and I thank all for attending but I just wasn’t myself I am afraid. One thing I will say is that my clients are just bloody awesome as they really understanding. It was difficult clearing my diary as I felt like I was letting everyone down but I must remember I can’t help others if I don’t help myself. Exercising starts a biological cascade of events that results in many health benefits, such as protecting against heart disease and diabetes, improving sleep, and lowering blood pressure. High-intensity exercise releases the body’s feel-good chemicals called endorphins, resulting in the “runner’s high” that joggers report. But for most of us, the real value is in low-intensity exercise sustained over time. That kind of activity spurs the release of proteins called neurotrophic or growth factors, which cause nerve cells to grow and make new connections. The improvement in brain function makes you feel better. “In people who are depressed, neuroscientists have noticed that the hippocampus in the brain—the region that helps regulate mood—is smaller. Exercise supports nerve cell growth in the hippocampus, improving nerve cell connections, which helps relieve depression. This information is not intended or implied to be a substitute for professional medical advice, diagnosis or treatment. All content, including text, graphics, images and information, contained on or available through this is for general information purposes only. 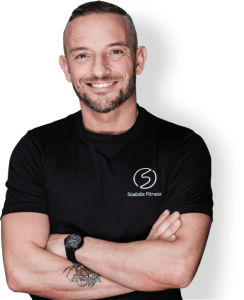 Stabilis Fitness and The Gym Group makes no representation and assumes no responsibility for the accuracy of information contained on or available through this, and such information is subject to change without notice. You are encouraged to confirm any information obtained from or through this with other sources, and review all information regarding any medical condition or treatment with your physician. NEVER DISREGARD PROFESSIONAL MEDICAL ADVICE OR DELAY SEEKING MEDICAL TREATMENT BECAUSE OF SOMETHING YOU HAVE READ ON OR ACCESSED THROUGH THIS WEB SITE. Stabilis Fitness and The Gym Group does not recommend, endorse or make any representation about the efficacy, appropriateness or suitability of any specific tests, products, procedures, treatments, services, opinions, health care providers or other information that may be contained on or available through this. < Previous Have we gone too far with the whole body conscious thing? Next > Simple strategies to fat loss yet so many people cannot shift it. Why?